Is Porter Yett polluting Cully’s air? 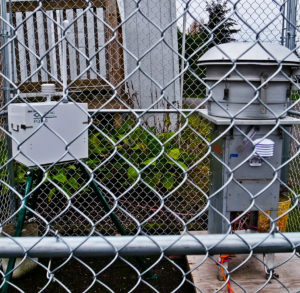 CAAT has been working with various state agencies over the past year, reviewing permits and rules, following up on complaints and installing monitors to test for and affirm previous heavy metal contaminations of the Cully area. 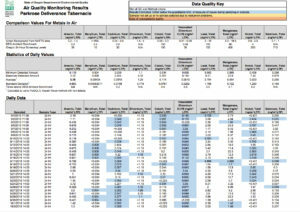 Last month CAAT received the first round of monitoring data. While the monitors are not testing for VOCs or PM, the results show an alarming spike in nickel from September 26-29th, 2016. In particular, the reading for September 29th was roughly ten times the average for the rest of the months readings. This spike may be an isolated incident dependent on faulty calibration of the monitoring equipment, machine failure, or another cause yet it may also be indicative of a pattern for spikes in heavy metal contamination. 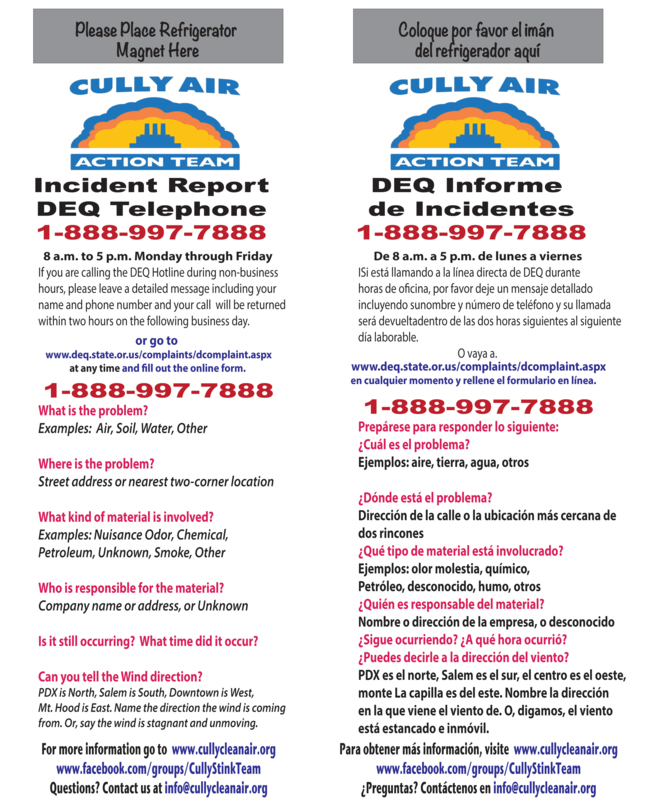 That is why we are insisting that DEQ continue monitoring the quality of the air in the Cully region throughout the next few months. Clearly, something was happening with nickel distribution into the Cully airshed during this time. “Most of the nickel absorbed every day by humans is removed by the kidneys and passed out of the body through urine or is eliminated through the gastrointestinal tract without being absorbed. Nickel is not a cumulative poison, but larger doses or chronic exposure may be toxic, even carcinogenic, and constitute an occupational hazard. In the US, the minimal risk level of nickel and its compounds is set to 0.2 µg/m3 for inhalation during 15–364 days. Nickel sulfide fume and dust are believed carcinogenic, and various other nickel compounds may be as well. Nickel carbonyl [Ni(CO) is an extremely toxic gas. The toxicity of metal carbonyls is a function of both the toxicity of the metal and the off-gassing of carbon monoxide from the carbonyl functional groups; nickel carbonyl is also explosive in air. How is nickel used in industrial processes? We know that the Porter Yett facility burns Tar Sands oil regularly, creating nuisance odors over wide areas of Cully. We also know that Tar Sands contains nickel: “bitumen in the Canadian oil sands contains Vanadium, Nickel, and other metals in significantly larger quantities than occur in most other oils.” Could there be a connection here? Finding the cause of these spikes, the ‘attributable source’, is part of the mystery that confounds DEQ under it’s present regulatory limitations. If the polluter does not admit and list their releases it is difficult to assign blame. 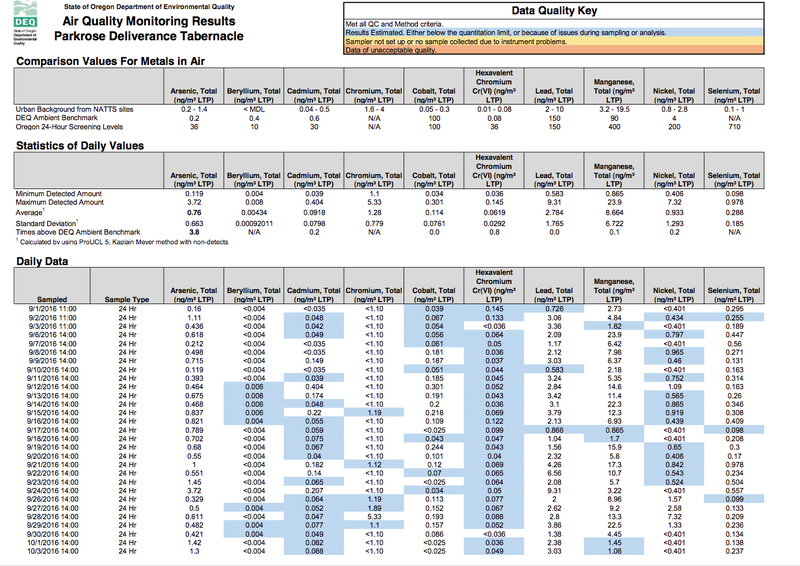 There is no obvious ‘smoking gun.’ This makes continued monitoring essential as we attempt to make the Cully airshed safer for everyone and everything that breathes. CAAT will also request DEQ data on any complaints filed concerning asphalt odors during the last week of September 2016. By comparing community complaints with contaminant spikes we may be able ascertain the source and move into the regulatory area where we can stop the contamination from continuing to occur. 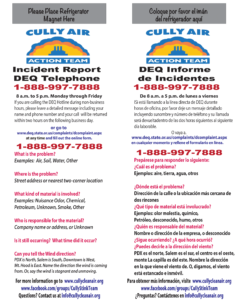 You can place this on your refrigerator to have quick access to DEQ complaint lines.